Ken’s contribution to the 2nd edition of Lucy Miller Murray’s book, Adams to Zemlinsky: A Guide to Selected Chamber Music. The much expanded and updated work includes several new essays, including one on Hans Gal’s String Trio, opus 104. Lucy asked Ken for a performer’s view of the work, one of many such contributions (from some very distinguished artists!) in the book. When people encounter Hans Gál’s music for the first time, the experience is a bit like meeting a long-lost relative. The many threads that come together in his music mean that we feel an instant sense of familiarity, although we’ve only begun to know this music in the last decade. Gál grew up in a Vienna saturated with the music of Mahler. He counted Richard Strauss among his most committed advocates and his teachers included close friends and disciples of Brahms and Bruckner. His language is rooted in the lush and sophisticated world of Viennese late-Romanticism that now permeates our musical life. But his grammar and his syntax reach farther back. Like Brahms, Gál may have spoken a Romantic, or even post-Romantic language, but he had the temperament of a Classicist. His music is a model of economy, wit, and understatement. Where Richard Strauss can be grandiose (in the very best sense), Gál is transparent, concise and intimate. If his music sounds like the late-Romantics, it behaves like that of Schubert, Mozart and Haydn. The coming-together of these threads, a highly sophisticated harmonic language and a very transparent and lean way of writing, means that Gál’s music offers some of the most striking technical and musical challenges for the performer. Not even Schubert is as demanding or unforgiving. As a trio, we’ve invested countless hours in tuning and balancing it. It can be as complex, athletic, and virtuosic as Mahler or Strauss, as intense as Brahms, but also as exposed as Mozart. Gál was also an expert in counterpoint, which means the performers have to cultivate an extremely vivid sense of awareness of texture and a sensitivity to our ever-changing roles. Gál’s symphonies, his concerti, his many fascinating ensemble works are all, first and foremost, chamber music. In Gál, every individual part is engaged with every other. It is, however, perhaps in his string quartets and string trios that his links with Beethoven, Schubert, Haydn and Brahms become most apparent. How inspiring that this remarkable man was still quietly and confidently carrying forward the tradition he embodied as late as the 1970’s, when the beautiful and elegiac String Trio, Op. 104 was written. Gál was not a naïve man. He knew full well that his long creative life had left him looking like something of an anachronism, but his engagement with the past and with the great Viennese tradition is never simplistic or merely nostalgic. Gál knew all too well the qualities of the musical tradition that had been lost in his lifetime. His post-War works share a sense of trying to give back to the world a little bit of the humanity, wit, and sheer beauty that he had been so steeped in as a young boy in the Vienna of Brahms and Mahler. Ultimately, the power of this music resides also in its honesty, in the way he brings our engagement with the music of the past to life while also gently reminding us that the great Viennese tradition, from Haydn to Schubert to Mahler to Gál, was ultimately to be a thing of the past when its last modest master passed away in 1987. Ensemble Epomeo’s violist, David Yang, talks about the Schnittke String Trio, one of the cornerstone’s of the Ensemble’s repertoire. Art which brings out our alone-ness in the world makes me feel particularly alive; I find myself drawn to the language of despair. This is true across the artistic spectrum – fiction, architecture, illustration, photography – but most especially with music. While there are more cheerful pieces out there, to call this trio unrelentingly gloomy is not accurate; it contains moments of profound calm intermixed with flowing melody and sections which conjure images of distant marching armies of the dead with far off trumpet-calls to arms. But for me the general tone is overshadowed by a few moments of pure, unbridled terror. The catastrophic stroke that Schnittke suffered while writing this work is felt midway through the first movement and the repercussions of the trauma echo through to the end; this is not a grateful “Holy Song of Thanksgiving to the Divinity” but a window into a soul engaged in a titanic struggle for its life. Towards the end one does attain a kind of peace but after the last, bitter chord the violin forges on alone, burrowing through to the end of the tunnel with the very last of its strength and, breaking through, finds neither light nor air but only a question: the endless dark of eternity. For a piece that is only twenty-five minutes long it can feel as if you have been playing for hours. Apart from obvious technical demands on the ensemble there are extremes in color and dynamics which actually resulted in a fine Hill bow exploding into splinters during a rehearsal of the work. The performer walks away completely shelled by this piece and inevitably the audience responds not only to the struggle inherent in the music but the struggle of the music as well. 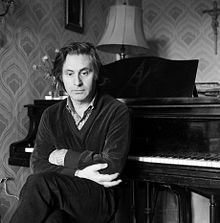 Put another way: people react not only to what Schnittke was trying to convey but to the physical difficulty the musicians endure while acting as the medium through which his ideas are made manifest. People will often sit, stunned, for minutes afterwards as we, the performers, slowly pull ourselves back together.